Weather aside, getting your workout done in the morning frees up your evening. Follow these tips to jump-start your day. Research your route: Apprehension about not knowing where to go on your morning jog can make it harder to get excited to forgo the snooze button for a run. Research popular running routes to find safe, fun routes that are good for morning runners. Join a running group: The encouragement — or admonishment — of a running group can hold you accountable, especially when you’d rather snooze. By syncing with others who love to run, you might just have more fun on your daily jog, which can help you stick with your new morning habit. Ask your local running shoe or sporting goods store if they know of any running meet-ups in your area. Prep at night: What to eat, what to wear, what to bring: taking care of all these elements right before your run can make for a hectic morning! Instead, make sure you’ve prepared what you need before you go to bed; check your pantry to make sure you’re stocked up on oatmeal, lay out your running outfit, and ensure your workout playlist is downloaded and your iPod is fully charged. There’s nothing like realizing you don’t have any clean running capris or that you’ve misplaced your earbuds to throw a wrench in your whole jogging routine. Start small: Even if you’re used to hour-long runs in the evening, waking up in time to digest your pre-workout snack, fit in a longer run, and get ready for work may not be in the cards. 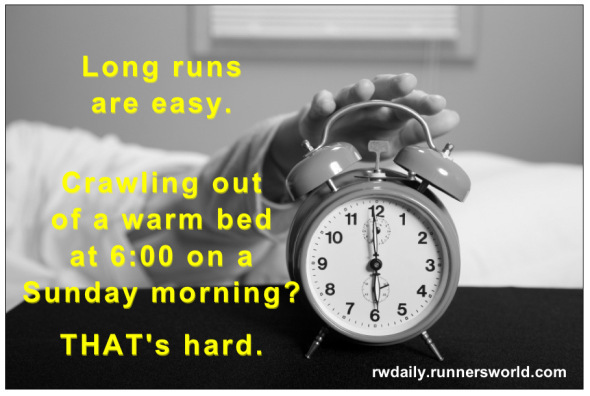 Start with shorter runs so your morning habit seems more manageable until you become accustomed to morning running. Try adding high-intensity intervals to your runs so you’ll still be burning major calories and becoming a better runner even if you cut your run a little short. End at the coffee shop: There’s nothing like a fun incentive to get yourself up and out of bed. Pick a route that goes by your favorite cafe so you can occasionally pick up a post-run treat. Just make sure your breakfast doesn’t undo all your early-morning efforts by avoiding these coffee-shop foods and saving calories on your coffee with these tips.